This photo of a lovely blackhouse was taken by DJ Maclean, who was headmaster at Valtos School. It is obviously somewhere in Lewis, though not necessarily in Uig and we certainly can’t place it. Note the further thatched houses up the road, and the car and lorry. Any suggestions? I’m wondering if it’s Calbost. Thanks to Susan Maclean for the image. 7 Responses to Cait’ a’ bheil seo? I think that this is possibly the original No4 Geshader, the late Finlay’s folk’s house. the road coming over the hill seems familiar to me having to traverse it to school at Lochcroistean for the duration of my primary schooling. I think the house in the distance may be Fearchar’s house (John Knox’s father). If not the MacIver’s house at no 4, it must be the one next to it at the bottom of the Giblan’s croft. The house was not standing during my childhood, and what throws most viewers may be the angle at which the picture is taken. It may also be that due to the low level of the picture, that it is hiding No.4 behind the thatched house. Ther was a road in geshader before the 1950′s although it was not a tarmac one. I remember Tawse tarring it in the late 50s. first time we had ever seen a Barber Green tarring machine and Barnie’s Thames Trader with the road chips. I think the croft at the back with the small thatched cottage belonged to Uilleam ( a Hool) and the edge of Geshader loch can be just seen behind the house in the foreground. 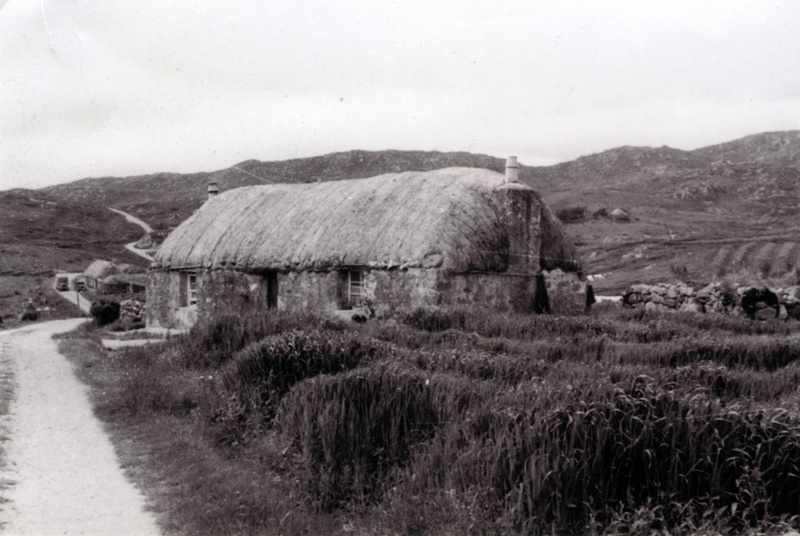 Kenny Angus Mackay, Geshader, who spent 19 years in Scalpay reckons the photograph was taken in Kyles Scalpay before the road was improved and that the house still stands although not thatched. I agree entirely with Kenny Angus Mackay’s hunch that it is Kyles Scalpay on Harris. It is a place I’m very familiar with and was instantly recognisable. If you go onto Google Street View you will see the original thatched house, now with a tiled roof, and from that viewpoint (facing west) you can see features of the landscape, especialy contours of the hills and rocky outcrops, which place it, beyond doubt, as Kyles Scalpay. In fact I would go as far as to say that the house in the foreground is Croft No. 12 which had its thatched roof until 1980′s. Kyles Scalpay, Isle of Harris.